Dentists – Making the world a better place, one smile at a time! A smile is said to be the best jewel of a person, but with problems in your teeth, you can often feel shy and uncomfortable to smile wholeheartedly, especially in front of others. According to dentists, teeth are considered to be a sensitive and crucial part of overall health. Healthy eating, chewing, digesting and even thinking; all depends on how healthy and strong your teeth are. But, most of the population takes the dental health for granted and also ignore the symptoms that often lead to dental problems in the future. Not only this, but people also tend to believe several myths that are there in the market around teeth and dental health. 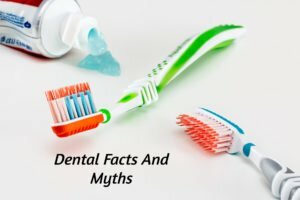 These myths have instilled themselves as facts in the minds’ of the people, which also lead to ignorance of signs that can lead to possible dental problems in the future. Some of the misconceptions also create anxiety among people about going to the dentist and also result in avoiding it altogether. So, let’s have a look at the misconceptions among people and clear them up with the facts straight from the experienced dentists. Myth 1: More white teeth mean healthier teeth. Fact 1: A whiter and brighter smile surely is a confidence booster and an impressive quality of your overall personality. However, this does not mean that your teeth are healthy and fine. Ensuring you have healthy teeth should be your top priority. As per dentists, the aspects that consider your teeth as healthy and fine are presence of cavities, gum health and jaw bone health, not only white teeth. Myth 2: Having your gums bleed is normal, it happens to everyone! Fact 2: Occasional bleeding gums are not okay. You got that right. Many people feel that bleeding gums can do no harm, but it’s not like that. They are a sign of gum disease, which simply means there is nothing normal about it. This also explains that for quite some time now a lot of calculus (hard deposits stuck on your teeth) has already accumulated, making your gums swell and bleed. Also, gum diseases left untreated may cause the loss of your teeth. Fact 3: A dentist is not only here to perform dental cleaning and other regular services. Along with cleaning and extraction services, an experienced dentist can also perform cosmetic services such as Invisalign and teeth whitening. Along with these root canals, oral cancer exam and many more services are offered by dentists. Myth 4: You can’t have braces as teenagers, but only as kids. Fact 4: Though correcting teeth problems at an early age is the best time, but that does not mean that you cannot get them aligned as a teenager. There are several options today that can help you achieve straighter teeth aside from traditional metal braces, all of which you can consult with your dentist. Myth 5: Brushing regularly means you do not need to floss. Fact 5: Brushing properly regularly is a good habit, but it cleans only 65% of your teeth. So, what about the other 35%? The left space is the surface in between your teeth which the toothbrush cannot reach (even if you use ultra-thin bristles). Only a dental floss can remove food debris stuck in these areas. Neglecting to floss (which you should do every night) may lead to cavities, which cannot be noticed because they are formed between your teeth and can only be detected by dental X-rays. Myth 6: While having baby teeth your kid does not need to see the dentist. Fact 6: This is the basic thing that every parent is misinformed about is that baby teeth are not as important as permanent teeth. This is not at all true. Yes, you got that right! Baby teeth are as important as permanent teeth. Cavities on baby teeth should be restored and filled before they lead to toothache or infection. They also play a big role in guiding the erupting permanent teeth in the right position. Misalignment in permanent teeth happens because baby teeth are sometimes removed too early because of any problem. Myth 7: Going to a dentist means pain. Fact 7: Talk about going to a dentist and many people are afraid of having any treatment as it can lead to a lot of pain. Well, this is not at all true. This is a common reason of not visiting a dentist, but this does not ensure that every treatment will have pain associated with it. Most routine dental procedures such as scaling, polishing and tooth-filling can be performed without anesthesia. However, some of the treatments might cause some discomfort but are painless. Myth 8: Aesthetic value is found in well-aligned teeth. Fact 8: Well-aligned teeth do look good and can certainly boost the confidence of a person, but this is not the only thing that they are for. Having straight teeth mean easy-to-maintain and good oral hygiene, this as a habit needs to be developed in everyone at an early age. Crowding of teeth on the surfaces do not allow brushing to happen properly, eventually leading to gum disease or tooth decay. Addition to that, correction of a bad bite produces an even distribution of biting forces on all the teeth, reducing the risk of trauma to the jaw joints as compared to someone whose teeth do not occlude properly to touch each other properly. For better awareness about your teeth position, it is better to get an orthodontic assessment from your dentist. Myth 9: Your teeth will be abraded by dental scaling. Fact 9: Excess of everything is known to harm you or your loved ones. There are right intervals when dental scaling and polishing should be done and will not do any damage to your teeth. The right interval is usually after 6 months or what is recommended by your dentist. If you or someone around you has a gum problem, then you all need to visit your dentist after every 3-4 months. Myth 10: Wearing dentures 24/7 is fine. Fact 10: Wearing your dentures during the day is fine, but it is recommended to remove them before going to bed. One of the reasons for doing this you will let your gums breathe from the constant pressure of the dentures. By soaking, dentures in a denture cleaning solution will keep them clean. If they are not cleaned and cared for, then there is a lot of possibility of having bacteria causing sores and irritation to the gums and palate. Apart from these myths, people also consider dental procedures are costly. This is also not true. If you take care of your teeth daily, then you would not need to go to a dentist and spend your hard earned money on dental procedures. So, give your teeth the right dental care for a healthy smile and teeth!